The guys in the band Na’an Stop live together. They create together. They tour together. And then they return from touring together and live together some more (one or two girlfriends live with them, too, it seems). They must really, really be friends. “We were friends first,” said Patrick Mulholland, who plays trombone and other instruments for the band. The five members met as students at the University of Colorado-Boulder. They’re not in school anymore. Now it’s all about the band, which occupies a home off Table Mesa Drive in south Boulder. They say they chose the neighborhood because that’s “where the basements are and it’s affordable.” They have a practice room in the basement. It’s easy to pick out the place, because — at least as of earlier this month — they parked their tour bus in the driveway. 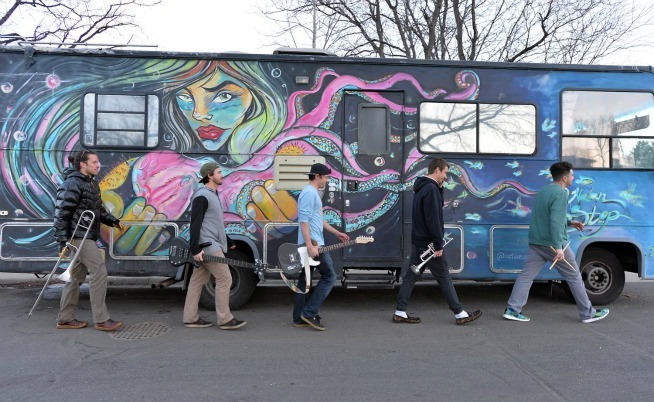 It’s a 28-foot-long Coachman Santara RV painted with a 28-foot-long mural of a bluish, plump-lipped lady holding a pink octopus. The other good thing about the neighborhood is that members of the band Policulture are close neighbors — so close, explained Na’an Stop’s David Halvorson Jr., that “you could blow-dart them in the face” from where he sat. There won’t be any blow-darting between these tribes, however, because the two bands are musically close, too, with their shared Colorado reggae essence. In fact, Policulture is one of the opening acts for Na’an Stop’s headlining gig at the Fox Theatre on Feb. 6. Na’an Stop — it’s simple to say, just like “nonstop” — spent December playing dates in New Mexico, Arizona and California. In November, they toured the Midwest. They’ve recently put 19,000 miles on the RV (which, at most, gets 8 miles a gallon — time for an EV RV, guys). But the Fox, with which they’ve had a fruitful relationship going back a couple of years, holds a special place in their hearts. It’s their hometown club. Na’an Stop’s debut album, From the Deep, came out last March, and a couple of months ago they released a video for one of the songs, “Win a Bagel,” which, for Na’an Stop novices, gives a pretty good sense of the band’s sense of humor, which is a little sick, and its music, which delivers a horn-enhanced groove that makes your head bop. “We were all going ham in there,” Smith said. A new video, for the song “Instant Gratification,” is due out Tuesday. The band, which includes Tom Huber on guitar and Joe Pesa on drums, previously had released an EP, It’s All in the Cheese. 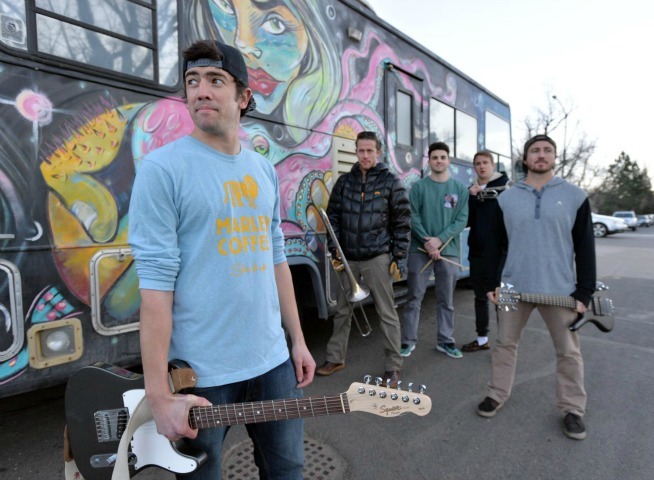 Also on the Feb. 6 Fox Theatre bill is Boulder rock and funk band Realtalk. The band recently released a video for their song “Freddie,” which was inspired by the protests stemming from the death of a Baltimore man while in police custody.